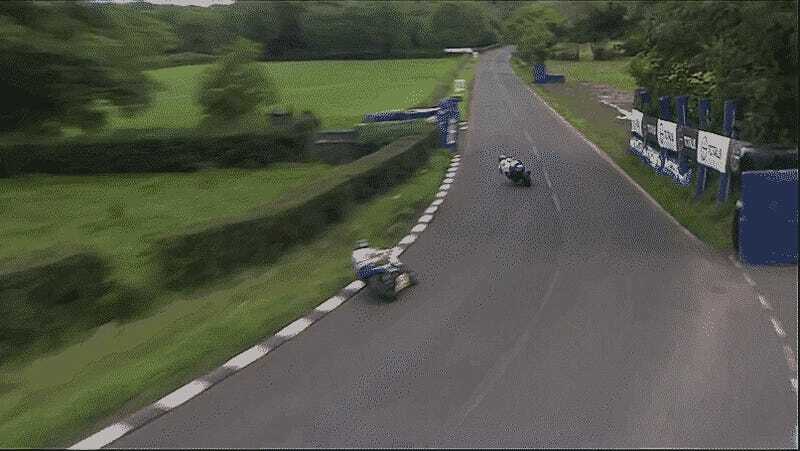 Guy Martin is a man unlike other men. He’s had some of the most epic crashes in road racing history, including this recent one from the Ulster GP on August 6th. Now, just a few weeks later and with a few more pieces of metal in his body he’s up, he’s back at work, and he’s alright....really. An accident like this would keep a normal human laid up in the hospital for weeks, and back at work in a month. But, for the member of the X-Men whose mutant power regenerative healing, a mere five days in the hospital and then six more at home hanging out and it was time to get back after it. After all, he only broke vertebrae, his sternum, some ribs, and injured his hand. Martin isn’t completely without caution however. The 33 year old postponed his attempt at breaking the land speed record of 376.363 mph in a Triumph spaceship that was supposed to take place weeks after his little hospital stay. The icing on the cake is this interview with BBC, where Martin assures us he’s alright. Really alright. Seriously guys, he’s alright. No big deal. Nothing to see here. The crash wasn’t even that bad. All he did was take out a bush or two. Totally alright. If anyone asks if you might know any mutants, do our buddy Guy a favor and keep your trap shut. No one suspicious here.